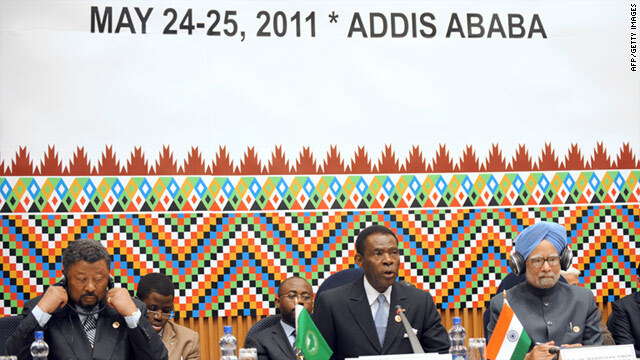 Indian PM Manmohan Singh (right), Equatorial Guinea President Teodoro Obiang Nguema (center) and Chairperson of the African Union Commision Jean Ping at the opening ceremony of the second Africa-India Forum Wednesday. (CNN) -- India has ramped up its economic push into Africa, announcing Wednesday a slew of investment and trading agreements with countries across the continent. Speaking at the second India-Africa Forum Summit in Ethiopia, Indian Prime Minister Manmohan Singh promised three-year credit lines of $5 billion to African countries to help them achieve their development goals. "Africa possesses all the pre-requisites to become a major growth pole of the world in the 21st century," said Singh Tuesday, at the first day of the Addis Ababa summit. "We will work with Africa to enable it to realize this potential," he added. The loans package comes as a follow up to the $5.4 billion credit Delhi offered at the first India-Africa summit in 2008. This $5 billion makes a statement that India is continuing to re-engage in Africa seriously. "This $5 billion makes a statement that India is continuing to re-engage in Africa seriously," said Alex Vines, of London-based think tank Chatham House. With its economy expected to expand 8.5% in 2011-12, according to the Organization for Economic Cooperation and Development, India is looking to fuel its growth. "Definitely India, with its growth projections, will need more energy and natural resources to sustain its emerging economy and that requires further deepening engagement in Africa," said Vines. "Natural resource diplomacy is one of them (strategies for engagement) -- for this be it oil, coal, uranium -- and another is about widening other connections that India has on the continent -- building infrastructure, agriculture expansion," he added. In recent years, bilateral trade between India and Africa has soared from about $1 billion in 2001 to $46 billion last year. However, it still lags far behind China. Last year, Beijing's bilateral trade with Africa surpassed $120 billion. Brahma Chellaney, a professor of strategic studies at the privately-funded Center for Policy Research in New Delhi, says that India is trying to differentiate itself from China. He says India cannot yet match Beijing's political and economic influence on the continent, arguing that India wants to put the emphasis on building strong, mutually beneficial bilateral ties with African countries. "India is not trying to catch up with China in resource acquisitions or investments in the mineral and oil fields -- it is trying to catch up with China in terms of geopolitical influence," he said. "In fact, India cannot compete with China in terms of acquiring mines, oil fields and other resources in Africa. So, it's doing what it is good at, which is to help build infrastructure development in Africa and create goodwill through a positive role," he said. Singh, who is on a six-day trip to Africa that started Monday, also pledged an additional $700 million for new institutions and training programs across the continent. As part of the agreements, India will finance the formation of the India-Africa Institute of Foreign Trade in Uganda, the India-Africa Institute of Information Technology in Ghana, the India-Africa Diamond Institute in Botswana, and the India-Africa Institute of Education, Planning and Administration in Burundi. "That is exactly what India is doing in Afghanistan too," said Chellaney. "They're building universities, highways, providing infrastructure support there, and as a result India has the highest positive rating of all countries in Afghanistan today, according to U.S. opinion polls. "India is trying to replicate the same model in Africa," he added.